Kate and Chelsie: ‘Ginbilee’ Celebrations With Bombay Sapphire. Chelsie: All across London the warm up celebrations for the Queen's Jubilee have begun! the Rib Room in the Jumeirah Carlton hotel, which has recently undergone a complete restoration are holding an unmissable Gin Masterclass rather fittingly called the 'Ginbilee'. This masterclass is in collaboration with the iconic gin Bombay Sapphire, which is a personal favourite of mine. The masterclass is led by brand ambassador Sam Carter who's knowledge of the brand is admirable. The class begins with guests being given mouth watering canapes, which were delicious, and really showed the culinary talent of the rib room. Following this, there is a brief overview of both the history of Gin and Bombay Sapphire. In this guests are given a hands on insight into the time and preparation that Bombay Sapphire put in to ensuring the finest quality in every bottle they produce. Then the gin drinking begins! Guests are introduced to five unique gin cocktails, each reinventing the classic gin and tonic. The final stage of the masterclass allows guests to go behind the bar, and let their imagination flow as they create there very own signature gin cocktail! If all of this was not enough, each guest is given their very own goodie bag to take home! If you thought you knew Gin, you better think again! Kate: Prior to the 'Ginbilee' masterclass, unlike Chelsie I had never tried gin before. I had wrongly been under the impression that gin was more suited to the older male audience! I am therefore delighted I attended this masterclass and got to see how enjoyable gin can be. The masterclass started at 2.30, we were shown to our seats at the bar and began to eye up the wide range of ingredients we could include in our very own gin cocktails (maybe fresh strawberry's?). We were warmly welcomed by Sam Carter (the brand ambassador) and given a refreshing iced water as he asked us about our experiences with gin. In no time at all the bar began to fill up with eager guests, the age range varied from early 20's to late 40's but regardless of this the atmosphere became light and fun. Sam began by making us all our very first gin and cocktail, the classic perhaps even unmatchable as was widely remarked in the class: Gin and tonic. The gin and tonic was distinctive, with a refreshing kick to it. It was then the perfectly timed and seemingly never ending array of rich canapes arrived. The food was divine, with a wide range of options including duck foie-gras, smoked salmon croquets and lobster spring rolls. Our favourite items undoubtedly were the smoked salmon and roast beef in a miniature Yorkshire pudding. The focus then shifted to Bombay Sapphire and its relationship with Gin. It was clear that from Bombay Sapphire's onset innovation and imagination are key in its production. We were told about the differing ways Gin is produced, and how Bombay Sapphire gin is distilled and why this is the case. We were also treated to a very hands on, and dare I say smells on demonstration of the various raw ingredients that can be used in the different Gin produced. The ingredients came from all over the world ranging from sunny Spain to the exotic Morocco, with each having there own distinct smell and taste. This really changed my perception of Gin, and I can honestly say after hearing what Sam had to say about the Bombay Sapphire it was inspiring to hear the great care and attention taken in each bottle produced. Chelsie: The next stage of the masterclass was the eagerly anticipated gin drinking! The gin cocktails that we sampled were really special. Bombay Sapphire especially for the 'Ginbilee' celebrations invited David Carter, internationally acclaimed interior designer and owner of boutique East London hotel 40 winks; Fiona Leahy, creative event designer and producer; Robbie Honey, globally acclaimed florist; Anna Bullus, award-winning product designer and Rhea Thierstein admired art director, set designer and prop stylist to unleash their creative talents and create their very own take on the timeless Gin and Tonic. I really had no idea what to expect, but I was excited! The first cocktail we sampled, freshly made in front of us was the 'Orange Blossom' by Robbie Honey. The drink combines orange blossom honey and Fever-Tree lemon tonic water; which gave the cocktail a beautiful summery smell with an intense citrus flavour. Next up we tried the 'Last Rasp' by David Carter, this cocktail contained as the name would suggest crushed raspberries and fresh basil leaves. This was my favourite gin cocktail, and the taste was perfectly balanced! 'Diamond Rose' by Fiona Leahy was our next cocktail, with a touch of delicate rosewater, slices of lemon and clapped mint this pretty fairy tale cocktail was ready to be sampled. This cocktail was very sweet, and defiantly for those with a sweet tooth! This was followed by Anna Bullus's 'Souchong Fizz' which combined Lapsang Souchong Tea syrup and lemon to create the perfect cocktail for you tea-lovers out there! The fifth and final cocktail by Rhea Thierstein was a complete surprise. Sam before creating the cocktail explained that the chunks of grapefruit he was putting in and mixing with vanilla sugar syrup would taste just like chocolate. I was somewhat dubious about this, but I was wrong! It tasted just like chocolate, and I really enjoyed the novelty of trying a cocktail that bought out such unexpected flavours and tastes considering the initial ingredients! Each cocktail looked beautiful, and was made within a suitable time period, meaning we could sip and exchange thoughts and ideas on the different cocktail with one another. Feeling slightly lightheaded we were then allowed to go behind the bar and create our very own cocktail! I was delighted to be standing behind such a vast and impressive bar, and in light of the wide range of ingredients pondered briefly on what my cocktail would contain. My creation was simple, but satisfying- a strawberry and vanilla infused gin and tonic with some additional strawberries for garnish- Perfecto! Who says that something simple cannot taste oh so yummy? I am very proud of my creation, and those that sampled my cocktail really enjoyed it! Kate: Chelsie and I both really enjoyed sampling the cocktails, but without doubt our favourite part was going behind the bar. Sam gave his full attention to me, and was full of helpful hints and ideas for my very own cocktail! It was so much fun behind the bar, trying to get the right amount of ingredients, and getting the full scoop of ice inside the glasses. Coincidentally I asked Sam about the choice of glasses out of shire curiosity and learnt the following: The glasses are Spanish by origin, and the shape is designed to allow the full aroma of the gin cocktail to be fully enabled because according to researchers up to 80% of the flavours we taste come from what we smell. I really enjoyed that this masterclass was both fun and informative at the same time. Unfortunately I am not as creative as the hand picked five, but I did give it my best efforts combining one of my favourite fruits blueberries, with vanilla to the gin and tonic with some lemon garnish to create my very own 'Blueberry Dream' cocktail. When we had all finished making our cocktails, we all tried each others which was a nice touch, and has certainly given me some ideas for other gin cocktails I will be making at my next party! The masterclass sadly had finished, and we were all presented with our very own goodie bags. The goodie bags were beyond generous with our very own bottle of Bombay Sapphire, complete with three tonics and some delicious white chocolate truffles. The perfect ending to a perfect class! Kate and Chelsie's Quick Guide To Bombay Sapphire's 'Ginbilee': To put it simply this masterclass is first class! Regardless of your age, gender or even Gin experience this class is hands on dynamic and offers something completely unique to its guests. It must be mentioned that Sam Carter really excels in this masterclass, his knowledge and enthusiasm is contagious and creates a great atmosphere! This masterclass would be perfect to enjoy with friends (as we did), a birthday treat, hen party or even work function. 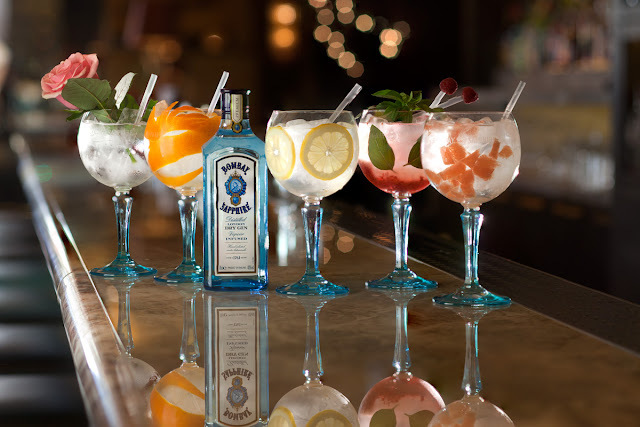 The Bombay Sapphire ‘Ginbilee’ masterclasses will be held on Saturday 26 May from 2.30pm- 5.00pm (max. 10-12 people per class). If however you are unable to attend the masterclass fear not, The Rib Room Bar & Restaurant will also be serving the specially created Bombay Sapphire Gin and Tonic infusions for a month prior to the Jubilee weekend, priced at just £13.50 each.